Behind the scenes or under the hood of the classic old style slot machine runs an elaborate configuration of gears and levers. The central element is a metal shaft, which supports the reels. This shaft is connected to a handle mechanism that gets things moving. A braking system brings the spinning reels to a stop, and sensors communicate the position of the reels to the payout system. A coin detector initially registers that a coin has been inserted and unlocks a brake so the handle can move. Over the years, manufacturers have tried dozens of approaches to arranging these elements. The diagram above shows one such design. The design above includes three reels mounted on a central shaft. The central shaft also supports three notched discs, which are connected to the three reels. A second shaft below the central shaft supports a kicker, a piece of metal comprising three paddles. The kicker paddles are lined up so they can push against the notches on the three discs. The second shaft also supports a series of connected stoppers, teeth that lock into the notches on the discs. Conventional mechanical slot machines eventually gave rise to electrical machines that worked on similar principles. 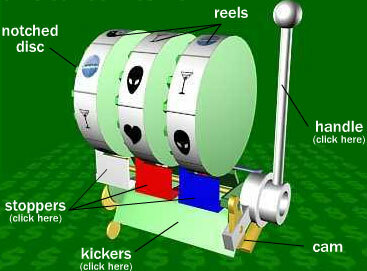 In an electrical machine, the reels are spun by motors and the stoppers are generally activated by electromagnets, but the game basically plays out the same way. Electrical machines have more sophisticated money-handling systems, like those you might find in a vending machine, and flashier light and sound displays. So that's the "old school" slot machine mechanism. Next we'll cover the modern slot machine.